Glasgow City had the chance to go out on a high when they welcomed Barcelona to Petershill Park. Being 0-5 down on aggregate, there was little expectation on the Scottish side to turn things around in the second leg and qualify for the next round of the UEFA Women's Champions League. The game picked up right from the start and both teams were eager to establish themselves in the match, but it was Barcelona that set the pace and pulled the City team apart with their intense pace of play and it was a matter of one or two touches, moving through the field. The likes of Andressa Alves and Melanie Serrano opened up a lot of space on the left wing, as did Natasa Andronova and Vicky Losada on the right, which allowed the team to work their way around the field. In the 14 minute Toni Duggan leapt onto a ball played through City’s defence, her pace putting her miles ahead of the defenders, and she slotted it in behind goalkeeper Lee Alexander. Barcelona continued to keep the possession after the first goal and kept a high pressure on the Scots, who did well fending them off and keeping a tight defence. But something had to give and early in the second half Alexia Putellas got the ball in the box and could coldly chip it past Alexander, who didn’t stand a chance. Shortly thereafter Duggan was there once again and grabbed a second goal, where she managed to draw of a bit of confusion, as the City players were asking for foul. The Englishwoman took down the ball in the box and controlled it, despite being surrounded by City players, and put it firmly behind Alexander. Both teams kept a high intensity throughout the game and City had some good spells, but did not manage to break through a Barcelona that was on top of every ball. 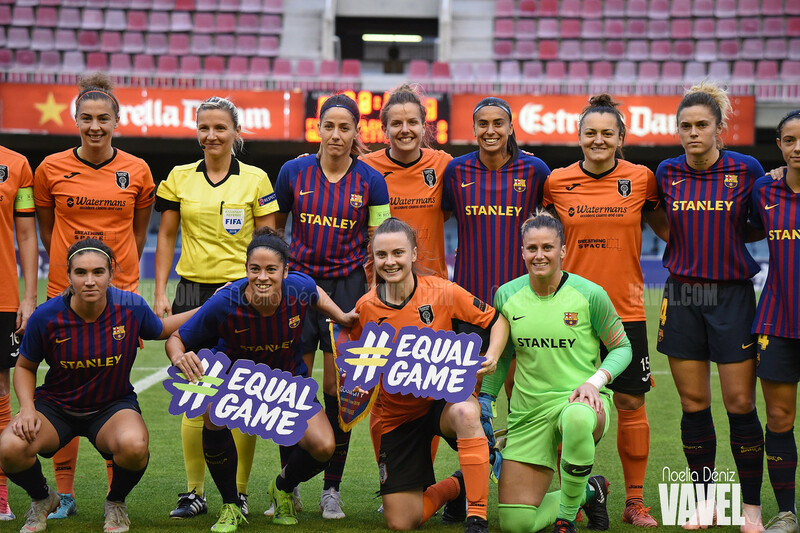 The Catalan side showed that they are a force to be reckoned with, even as they missed the likes of Lieke Martens and Kheira Hamraoui in the squad, and it is clear that they’ve got high aims for the upcoming season. Their style of play was effective and entertaining to watch and the way in which they executed every pass, every cross, every move, was impressive. Their fighting spirit was also very inspiring to see and the way in which, even as they were 3-0 up, never quit chasing that next goal. With the quality and character of that squad, they will definitely be a side to watch as we go further into the competition. Both teams fought really well and put in a good shift, but looking at the intensity of attacks, the big surprise was that Barcelona did not score more. Playing with a 3-5-2, they opened up the game and this complemented their style of play, allowing them those swift shifts from one wing to the other. But in the end, it was those well-placed, intelligent passes to the likes of Duggan and Putellas that proved the most effectual. The best player on the pitch was Andressa who, on her left wing, never stopped running for the ball, and never stopped making herself available, which in turn constantly gave Barca the option of playing wide on her. But she also worked tirelessly when the ball was not in the possession of the Catalans. Even if the scoreline didn’t reflect it, the City defence did a great job throughout most of the game. They followed through in the transitions from side to side as the rapid Barcelona attacks switched wing and they kept themselves organised and dense, which made it difficult for the Catalans to get close to goal and get a good shot in. Alexander had some outstanding saves and she kept the goal-count down with her excellent movement and a cheeky one-handed save close to the end. The 16-year-old centre back Carly Girasoli got another start and showed coach Scott Booth why he’s been right in picking her for the last couple of games, with her calm composure and good reading of the game. City should not feel too discouraged by the result. This was a big step for them, as it would've been for most teams, and it's a golden opportunity to take away things to work on, and also to see what does work. In a 4-3-3, the defence stuck together and positioned themselves really well, and as Barcelona rolled the ball around and pushed for that way in, they just kept denying them. Also up front, the likes of Kirsty Howat and Abbi Grant were doing their best to create chances and worked hard, even as the ball was not heading towards the opposition's goal. One thing that City can take away from the Barcelona team is to move the ball around quicker, which would allow them to keep some possession and force themselves into the game.